How to make your organization accountable? You are here: Home / Featured Articles: Fundraising, Proposal Writing & NGO Management / How to make your organization accountable? Over the past few decades NGOs have gained significant popularity as the third pillar of development and have played a key role in providing social, economic and environmental services to the marginalized. Growth of NGOs as providers of essential services and key players in policy reforms has been a global phenomenon. NGOs have worked very effectively in areas where both government and private players have failed miserably, this ability of NGOs to work in the most fragile and backward places has been recognized and applauded by both national and international entities. With the rising influence of NGOs in the development sector, there also has been an increase in questions regarding the accountability and legitimacy. NGOs have responded differently to the issues related to accountability and transparency. We bring to you some ways through which you can make your organization more accountable. Before talking about methods to ensure accountability in your organization, so let us understand the meaning of accountability, the aspects of accountability and its importance. Accountability basically refers to an organization being answerable to a third party. It refers to the obligation of an individual or organization to account for its activities, accept responsibility for them, and to disclose the results in a transparent manner. Accountability is a very large term and encompasses several issues of an NGO; some of these may include organizational management structure, financial procedures, human resource policies etc. Experts suggest that organizations with high accountability and credibility are often preferred by donors and are more likely to get funded. As an NGO you are accountable to donors, project partners, local communities and considering these, experts have suggested four aspects of accountability for an NGO. Upward Accountability: This refers to the responsibility of an NGO towards being accountable to funders, donors and government institutions. As an organization you are answerable to donors and funders about how you will be utilizing their money. Horizontal Accountability: This refers to being responsible with project partners, peers and related organizations. This also includes enhancing partnerships and collaborations with other organizations and stakeholders. Downward Accountability: This means that as an organization you are responsible towards your beneficiaries and the target audience. You have received funding from a donor for the upliftment and improvement of lives of these beneficiaries and therefore you are answerable to them. Along with being accountable to them you also should involve them with the project implementation. 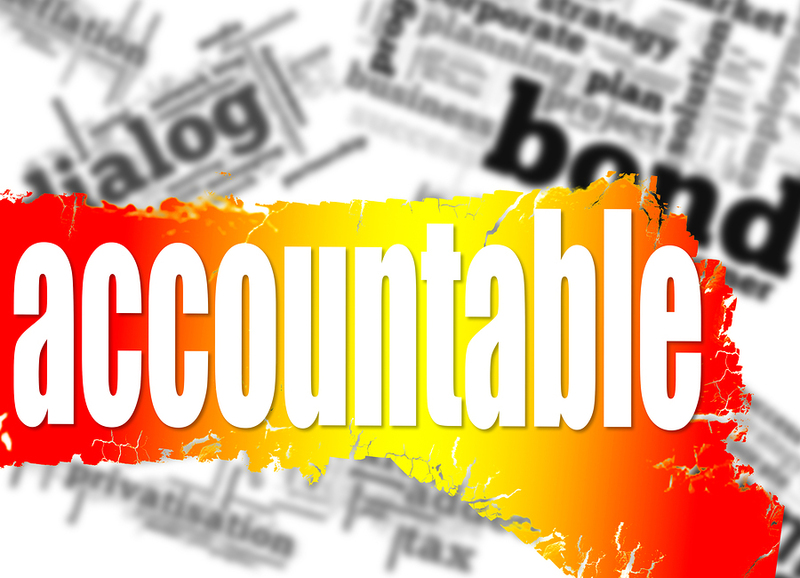 Internal Accountability: One of the most important aspects of accountability is to be answerable to your own employees and your organizations mission. It means that you have ethical standards and governance structures and justify your organizations core value. Most often NGOs give more importance to enhance external accountability and give little or no importance to other forms of accountability. This guide has been drafted keeping in mind all the aspects of accountability. You might be wondering that your organization has been doing exemplary social work for the last few decades and for these years you never worried about being accountable, so why this fuss? The following points will help you understand the importance of accountability. Improved relations with donors and funders: Most donor agencies prefer organizations that have well built accounting mechanisms. Financial security: With proper accounting and audits you are can ensure that all your transactions are secure and you are able to keep a check on money. Greater involvement of communities: Local communities tend to get involved with NGOs that have shown accountability in the past. Communities will support your cause and will participate in your project implementation. Facilitates partnerships and collaborations: Proper accountability tools will facilitate in developing partnerships with other organizations and agencies. Greater employability: Your staff will continue to work with you as they would feel secure to work for an organization that is credible. Improved performance: Accountability tools help you to keep check on your activities thereby improving your performance. Research reveals that NGOs with regulatory mechanisms are more effective in terms of their performance and impact. This section provides you with some tools that can be used to ensure accountability. Registration: Make sure your organization has a legal status and is registered under a relevant legal framework. Registering your NGO will not help you in enhancing your accountability but would also enable you to interact with government agencies and diverse donors. Your chances of getting financial support and assistance will also increase. Accreditations and certifications: This refers to an external agency certifying that your organization complies with a set of norms and policies. Accreditation ensures that your organization has been evaluated by a third party and fulfills the nationally recommended standards and policies. Annual Reports: Publishing your annual reports regularly is a great way to ensure that you are fulfilling the required activities responsibly. The annual report provides the readers with details about all the activities that your organization undertook a particular year. Make sure you use images and data to represent important changes and activities that you completed in a particular year. Financial Reports: Another important tool to enhance accountability is to regularly update and compile your financial reports. This report clearly indicates your income and expenditure on a monthly, quarterly and annual basis. Donors and supporters always trust organizations that show transparency in their financial transactions. Third Party Audits and Evaluation: Many organizations rely on evaluation and external audits as a accounting tool. The external audits help you to analyze and see if you are complying with the industry standards and norms. Publicize your activities: As long as you are not doing fraud you have nothing to fret so you should publicize your organizations activities. You can use take support of press and the internet to showcase your project activities. Publicizing your activities enhances your visibility and promotes public trust. Develop your own set of self regulation procedures: This is considered to be one of the most effective ways to enhance accountability. Develop your own policies of keeping records, formats for reports, trip and field reports, internal minutes. You can also start internal auditing every three months to keep a check on all activities. Stakeholder Feedback Reports: Start taking view points of the beneficiaries you are working with to understand their perceptions about a project. This way you can immediately respond to their issues and develop long term trust. Contact Information: Make sure that you provide accurate and correct contact details on your webpage, letter head and other communication. In case your office address changes, remember to send the updated address to the donors and relevant authorities. Improve communication channels: Develop communication channels so that you can share your impact stories with a large audience. You can do this through press releases, blogs, newsletters, magazines and social media updates. Initiating partnerships with renowned entities: Partnering with well established organizations help in getting recognition and trust of people. Get recognized for your work: Send in your organizations entry for various award functions and competitions. Getting awarded for a social cause will make you appear more accountable and will also enhance your public presence. Conduct due diligence before partnering with a new organization: Conduct in-depth research of a new partner firm before entering in a partnership. This will help you in selecting reliable partners who have a clean background and have not been involved in fraud or an anti-social activity. Make the list of trustees and board members public: Experts suggest that you the list of current Board members should be publicly accessible. You should update the list whenever there is a change of board members. Strengthen human resource policies: Develop strong human resources management policy that would ensure retention of staff and ethical hiring. Make sure the policies comply with relevant labor regulations applicable to your country. Appoint a rating agency or watchdog firm: Several organizations set up their own standards and rating systems to measure the performance of other organizations. The rating system can be applied to various activities and functions of the NGO. Adopt ethical fundraising methods: Ethical fundraising policies should be adopted while accepting funds. Make sure that you adhere to proper guidelines and report everything transparently to the donors. Clearly defined Membership Procedure: You should have proper guidelines relating to membership fees, member duties and responsibilities etc. Also share important decisions and update the members on a regular basis. The issue of NGO accountability has recently gained popularity and in the coming time will become a very important aspect in NGO management. Although International NGOs and few regional NGOs have been using various methods to enhance accountability for quite some time now; it is only recently that accountability questions are also being raised for small entities as well. We hope that you can adopt few tips from this guide to make your organization more accountable and credible.